The ICRA Nationals and Sovereigns’ Cup 2015 was launched today on board the Irish Naval vessel L.E Eithne by Simon Coveney TD, Minister for Agriculture, Food, the Marine and Defence who highlighted the importance of marine leisure for coastal communities. L.E. Eithne holds many memories for Corkonians who will remember when she was built at Verolme Cork Dockyard, Rushbrooke, to the design of Patrick G. Martin, Chief Naval Architect at the Yard and who still resides at Rushbrooke, Cobh, Cork. The four-day event will decide four national titles as well as the coveted Sovereign’s Cup, ensuring close competition in each class. Already, 80 boats have registered and this figure is expected to exceed 100 over the next two months. Cllr. Alan Coleman, Mayor of Cork County said Cork County Council is delighted to be one of the main sponsors of this international event as it affords us an opportunity to be associated with showcasing Kinsale, a major tourism and sailing centre of excellence both at home and abroad. 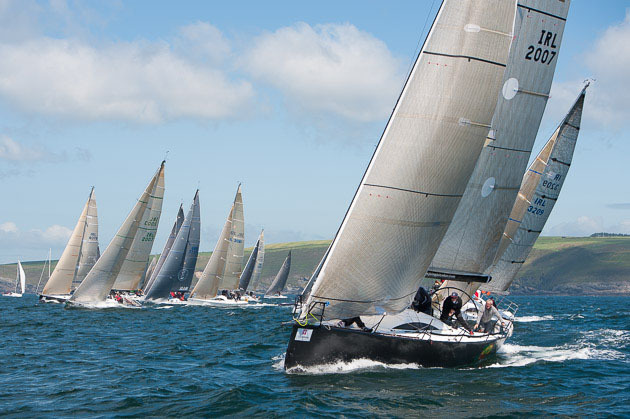 The regatta also promotes Kinsale as a base to tour the Cork Section of the Wild Atlantic Way both on land and sea,” he added. Regatta Director Mike Walsh thanked the Irish Naval service for their continued association and support for Kinsale. Commenting on the sailing event he said “We are particularly pleased with the strength and depth of the early entries this year and this promises a great series.